Ferno’s 35X PROFlexx X-Frame Ambulance Cot provides exceptional stability and safety when transferring and transporting patients. A longer, fixed front leg in the X-Frame, a rigid C-channel running the length of the cot, and carefully engineered geometry create a low center of gravity and minimal flex. The enhanced stability reduces the chances of tips or flips and other situations that can cause injury to patients and medics. SAE J3027 compliant when you combine the available 35XST option with the Stat Trac® Cot Fastener System. The 35X EZ Pull™ release system reduces wrist strain and helps you position yourself before assuming the weight of the cot and patient. Complete bariatric solution with push/pull handles, LBS or LBS Jr., 1100 lb load capacity in the lowest position, and true 360° turning radius in the lowest position. 5 Position drop frame provides better leverage for lifting & loading and reduces the cot length by 15” for movement in confined spaces. All-metal frame construction provides strength, durability, and exceptional performance with heavy patients. 6” wheels (two with swivel-lock and rolling-lock) feature U-tread tires with increased surface area for better rolling and longer life. Wider Bed Surface provides comfort and support for various size patients and increased room for CPR or intubation. 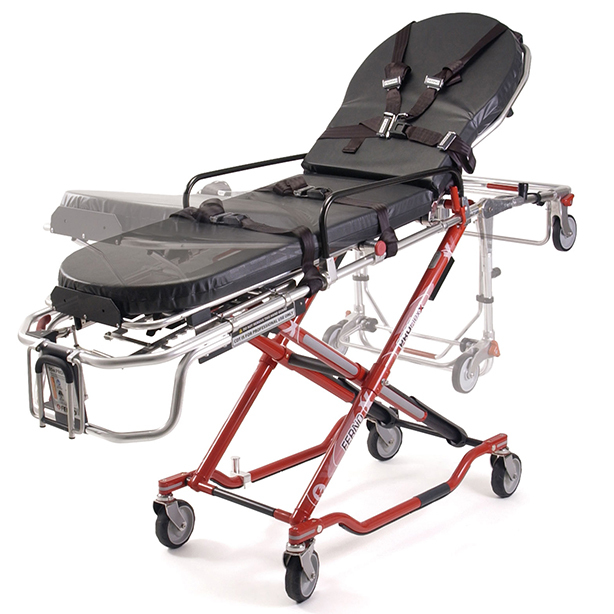 Pull-Out Side Lift Handles provide additional grip points for assistance with heavy patients. Reflective Labeling provides nighttime visibility for added safety (includes optional personalized graphics).